Resources are the people who work on a project. They can be assigned roles and allocated tasks, which enables tracking of effort and estimation of time to complete. You also define the effort, risks and metrics to support resource management. You allocate resources and update and delete the allocations using the Construct window. You can also review and delete listed allocated resources using the Resource Allocation window. The Construct window displays, defaulting to the 'Resource Allocation' page. Allocate a resource to an element. 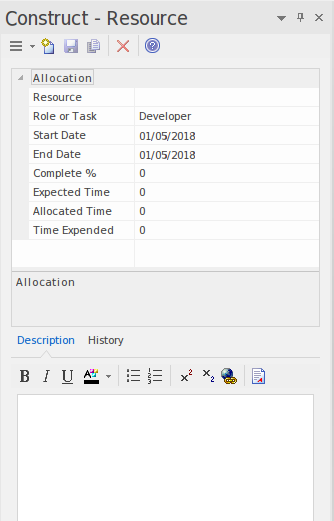 Record additional project management information for an element. Obtain a report of resource allocation details. Configure Project Management data and populate the drop-down lists used on the Project Management widows.